Graduated or gradient compression garments come in knee-high and thigh-high varieties. In this case the term “graduated” means that stronger pressure is delivered at the ankles. As the stockings continue up the legs this pressure gradually decreases, providing much less compression at the top. This greatly aids leg veins in performing their primary function of bringing blood back up the legs and towards the heart. Most major medical insurance companies require patients to first try to manage their symptoms by waring prescription compression stockings. While this can be helpful it won’t resolve the underlying problem and is largely seen as a formality. In practice, most patients considering VenaCure™ have already tried this and other conservative approaches and found temporary, limited relief. It should be noted however that compression stockings can be effective in delaying the progression of vein disease. In the early stages they can, hypothetically, prevent the problem from worsening to the point where treatment is needed. They’re also capable of reducing many veins symptoms to some degree, in some patients, yet are only effective when worn. This being said, prescription compression hose must be worn for a two week period following any VenaCure™ procedure. First and foremost, compression therapy lowers the risk of blood clot formation in the larger veins of the legs. It also speeds healing and reduces excessive swelling and bruising. Additionally, compression therapy ensures that the treated veins remain sealed. Compression hose are available in varying “strengths” based on how much compression is needed. These are measured in millimeters of mercury (mmHg), the same scale that is used to describe atmospheric pressure. For example, stockings rated at 8-15 mmHG deliver 8 units of compression at the top and 15 at the ankles. This is the lowest compression typically prescribed. By comparison 15-20mmHg is medium compression, 20-30 is firm, the 30-40 rating is rated as “extra-firm.” After a VenaCure™ procedure 20-30mmHG stockings are recommended. The only real concern is choosing a pair which aren’t too tight as this can interfere with arterial circulation. While some patients consider the stockings uncomfortable there are no other risks associated with this type of compression therapy. 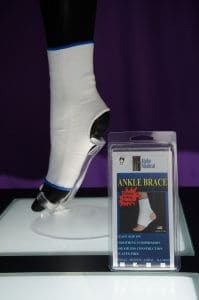 Ankle Brace – $10.00 – brace between the foot and the leg to support, compress or immobilize the joint to decrease edema, abnormal motion, and prevent or help heal injury. Comes in many styles.